You and a guest are invited to an advance screening of THE MIRACLE SEASON! Follow this link: http://www.gofobo.com/ycZLf79228 for your chance to download an admit-two pass to see the film on Wednesday, April 4 in Denver! Seating in the theatre is first-come, first-serve and is not guaranteed. Arrive early! 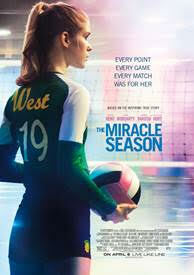 THE MIRACLE SEASON opens everywhere April 6.